And yes - when we hit the road in January - I will be packing my dancing shoes!”As well as enjoying the glittering routines, arena audiences have the power to decide who wins the coveted Glitterball Trophy at the end of each show. After each celebrity couple has performed, the tour judges will provide their invaluable critique and scores - but the audience can also vote via text for the favourite couple and ultimately they will decide who wins! 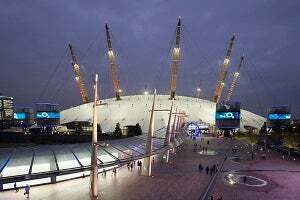 ( 6 minutes from North Greenwich Station Tube Station) Head northeast on Edmund Halley Way and continue for 0.1 miles (through 1 roundabout). Continue straight onto East Parkside for 151 feet. Turn left onto Peninsula Square and continue for 0.1 miles. Turn right to stay on Peninsula Square and continue for 279 feet.